Interior Minister and Deputy Prime Minister Matteo Salvini June 2018. Zucchi/Press Association. All rights reserved. Viktor Orbán’s battle against NGOs and Soros is well known, as is his admiration for some of Putin’s policies and for his model of ‘sovereign democracy’. In June 2017, the approval of a law providing for a special register for some NGOs financed from abroad, increasingly brought Orbán's Hungary closer to Putin's Russia model, where a law on so-called "foreign agents" has been in force since 2012. Both leaders see funding coming from beyond the borders as a dangerous interference in national affairs, which makes it necessary to adopt a model that Orbán himself has defined as "illiberal democracy". Orbán and Putin have never hidden their aversion to the current western liberal system. The models proposed by the two leaders are very similar, especially in their strong emphasis on an alleged national interest, which is the highest value, as opposed to single individual rights. The supremacy of the national interest is directly related to this battle against NGOs financed from abroad: such a law avows a protection of national interest, as it aims to disadvantage organizations that, to in Orbán’s rhetoric, pursue foreign interests in the country. The new Italian Minister of Interior, Matteo Salvini, has never hidden his sympathy for both Putin and Orbán. The latter, in particular, has gained Salvini’s admiration for his firm policies against migration. 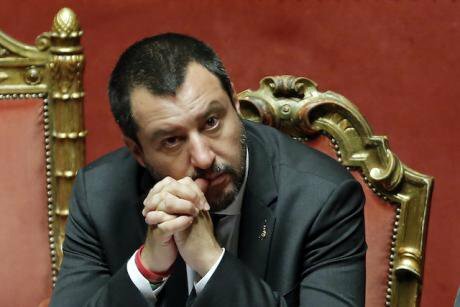 The new Italian government, especially in the figure of its Minister of Interior, is increasingly undertaking a battle against NGOs who rescue refugees from the Mediterranean and, therefore, help an alleged “invasion” onto Italian soil. Salvini is always very attentive in highlighting how these NGOs are not Italian, while they bring the rescued refugees to Italian ports. This stress on the foreign element of these NGOs, who allegedly act against the Italian national interest, could represent a first step towards more concrete measures against these newly identified enemies. The strong emphasis on national interest ("Italians first") and on security – in contrast with the potential danger coming from outside – are distinguishing features that Salvini shares with the rhetoric of both Orbán and Putin. These governments take charge of the voice of the people, annulling all pluralism and deciding what is in the interest of the nation, as if the latter was a mere agglomeration of identical citizens, without their specificities and diverse inclinations. It is the rhetoric of a "sovereign people", which, among other things, reduces the entire citizenship to the electorate of the ruling parties. From this vantage point, the route to an illiberal democracy is rather short. This stress on the national interest as the highest value to protect could eventually turn the Italian government into a regime which sacrifices the rights of the individuals for the higher good of the Volk. Is Italy going the Hungarian way? Italy is not (yet) an illiberal democracy. However, many elements may predict an increasingly harsh battle against non-governmental organizations and a crackdown on associations that deal with reception and integration. Although in a less blatant way than Orbán, Salvini has labelled Georg Soros “persona non grata”. At the end of last year, in fact, the leader of the Lega stated on Facebook that "Soros and his billions for illegal immigrants will be banned” and called the millionaire an “unwanted person”. More recently, another (far)right-wing party - Brothers of Italy (Fratelli d’Italia, FDI) – has come up with a proposal for a “Stop Soros” law in Italy. FDI, guided by Ms Giorgia Meloni, has run in the March elections within a coalition with Salvini’s Lega and Berlusconi’s Forza Italia, but – like Berlusconi’s party – it finally did not join the government with the Five Stars Movement. However, FDI’s ideas on migration and, especially, their rhetoric based on the slogan “Italians first”, remain very similar to the positions of the current Minister of Interior Matteo Salvini. Positions that, to say the truth, are rather inconsistent. Indeed, the Minister appears to be calling for more European solidarity and understandably asking for help from other EU countries, in asking for a redistribution of migrants. However, this part of his rhetoric is hardly consistent with his continuous praise for Orbán’s positions on migration. Indeed, Prime Minister Orbán wants the Hungarian borders to be closed and shows no intention of welcoming any refugees, least of all a redistribution of those arriving in other EU countries. Salvini pursues the same goal: his motto “Italians first” clearly shows that there is no space for more migrants in the near future. While for Salvini and his supporters solidarity towards migrants has become a thing for “do-gooders”, the other parts of Italian civil society will have a hard time trying to oppose an increasingly intolerant and sovereignist political discourse.